African mole rats eat a diet rich in bulbs. Photo by Justin Yeakel. Nathaniel Dominy and Justin Yeakel. Photo by Jennifer McNulty. Eight years ago, the field of anthropology was rocked by isotopic evidence that suggested one-third of the diet of early human ancestors consisted of grasses and sedges, or the tissue of animals that ate such plants. The news puzzled scientists, who were unable to reconcile the results with what they knew about the teeth of human ancestors who lived more than 2 million years ago. However, an experiment by a team of researchers at the University of California, Santa Cruz, suggests that consumption of bulbs and other underground parts of plants, rather than grasses, produced the puzzling isotopic evidence. They report their results in a paper titled "The Isotopic Ecology of African Mole Rats Informs Hypotheses on the Evolution of Human Diet," which appears in the current online issue of the Proceedings of the Royal Society B: Biological Sciences. The flat, thickly enameled molars of early humans have led scientists to infer that their diet consisted primarily of hard, brittle foods, such as seeds. But in light of recent findings, researchers speculated that a diet of corms, bulbs, rhizomes, and tubers of plants that use a form of photosynthesis that produces the same isotopic signature as grasses and sedges, could resolve the conundrum. The UCSC team tested the hypothesis by analyzing stable carbon and oxygen isotopes of the bone and tooth enamel of African mole rats, small tunneling rodents that eat primarily corms, bulbs, rhizomes, and tubers, otherwise known as plant underground storage organs (USOs). The team also analyzed the fossil remains of mole rats recovered from the same locations where Australopithecus africanus and Paranthropus robustus were discovered and found sufficient overlap between the isotopic signatures to support their contention that early human ancestors, like African mole rats, ate a diet rich in USOs. "This study certainly adds to the body of evidence that the diet of early hominins included bulbs and corms, and possibly tubers," said Nathaniel J. Dominy, assistant professor of anthropology, who was joined in the project by Paul L. Koch, professor of Earth and planetary sciences; lead author Justin D. Yeakel, a Ph.D. candidate in anthropology; and Nigel C. Bennett, professor of zoology at the University of Pretoria, South Africa. The ratios of carbon and oxygen isotopes reveal clues to both the dietary proclivities of animals and aspects of the environment they inhabit. "By comparing the isotopic results of modern animals with known diets to fossil species, we can begin to infer the foraging ecologies of extinct populations of animals," said Yeakel. Early humans would have encountered little competition for underground plant foods, noted Dominy. "African mole rats are small animals that forage mostly by luck, whereas bush pigs are largely nocturnal," he said. "Our early human ancestors had the advantage of a relatively large brain to help recognize specific plants and to make simple tools for extracting USOs from the ground." Importantly, he noted, the metabolic costs of a large brain would have been nourished by a diet of USOs, which are rich in carbohydrates. The findings appear to resolve the conundrum posed by the grasses and sedges hypothesis. "The classic way to infer diet is to look at the teeth because form follows function. Hominins had teeth like ours, which were designed to eat something really, really hard, like small seeds, not tough grasses or raw meat," said Dominy. "Mechanically, our teeth are poorly suited for chewing such tough foods." Adding to the consternation was a lack of evidence of habitual meat consumption more than 1.9 million years ago. Dominy's team's findings also provide significant new information about the diet of early humans, which is central to understanding human evolution. "We don't know exactly what hominins ate, but diet controls everything--locomotion, social organization, and reproduction," said Dominy. "Something about our ancestors' diet shifted to favor them becoming bipedal and increasingly brainy. No other organism on the planet evolved that way." 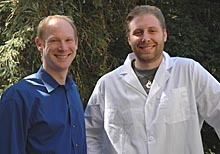 The research was supported by the American Philosophical Society, the UCSC Committee on Research, the UCSC Division of Social Sciences, the Wenner-Gren Foundation, and a grant from the National Science Foundation. Note to journalists: Dominy may be reached at njdominy@ucsc.edu or (831) 459-2541; Yeakel may be reached at jyeakel@pmc.ucsc.edu.